This “curry” (my apologies to Madhur Jaffrey, who once sniffed, “The word curry is as degrading to India’s great cuisine as the term chop suey , was to China’s”) is assertively flavored and a deep ochre yellow. 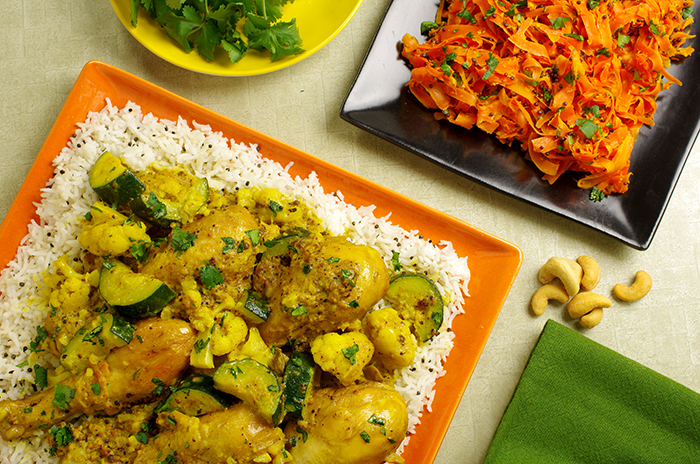 With cauliflower and zucchini cooked right in, what you’ll have in your bowl is an exotic meal worthy of a day spent wandering shoeless on the cool marble floors of the Taj Mahal. 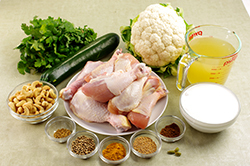 Rub the chicken with peanut oil, sprinkle with kosher salt, and set on the countertop for 30 minutes or so to take the chill off before cooking. 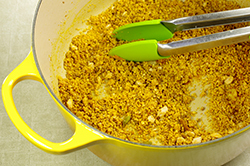 Heat the 1 tbsp peanut oil in a 12-in/30 cm or larger cast-iron frying pan or a 5-qt/5 l or larger Dutch oven over medium-high heat. 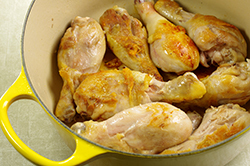 Working in batches, lay the chicken thighs in the pan, skin-side down, and cook, turning frequently, for 10 minutes, or until nicely browned on both sides. 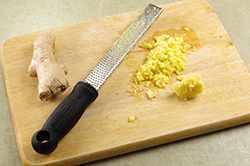 Transfer the chicken to a plate and pour off any excess fat but don’t wash the pan. Add the cashews, mustard seeds, garam masala, turmeric, cardamom, coriander, and fenugreek (if using) to the hot pan and stir well. 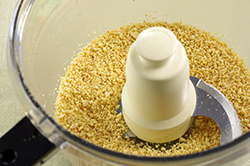 Cook for 2 to 3 minutes, or until fragrant and the mustard seeds pop. 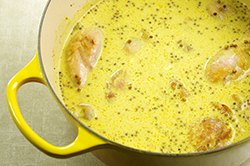 Add the stock and coconut milk, stir, and then nestle the chicken thighs into the sauce, skin-side up. 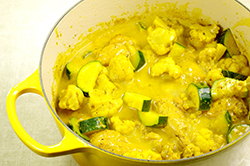 Simmer, uncovered, for 20 minutes before adding the zucchini and cauliflower. Cook, covered, for 8 to 10 minutes longer, or until the vegetables are just tender. Sprinkle on the cilantro and a little flaky salt before serving. I am a huge fan of brown rice, but many people -- including my husband, Dwight -- are not. 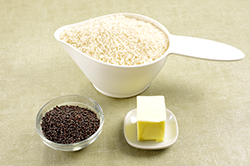 If you choose to make brown basmati rice, just plan accordingly, since it will take as long as 45 minutes. Rinse the rice in a colander under cold running water until the water runs clear. 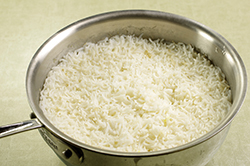 Drain off any remaining water and transfer the rice to a saucepan with a tight-fitting lid. Add the 4 cups/960 ml water, place over medium heat, cover, and cook until rice is tender and the water has evaporated, 12 to 15 minutes. Heat a pan over medium heat, add the mustard seeds and toast for 1 minute before adding the butter. Once the butter melts, toss with the rice. Finish with a generous pinch of flaky salt before serving. 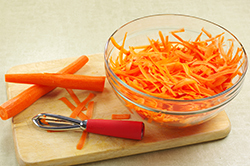 Delicious, fast, and pretty, I love carrots done this way served cold or hot. Heat the olive oil in a heavy sauté pan over medium heat. 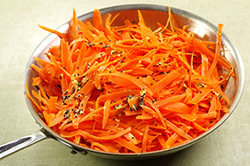 Add the carrots, mustard seeds, and ginger and cook, stirring frequently, for 5 to 7 minutes. The carrots should begin to blacken ever so slightly on the edges (delicious!) and the seeds should pop and color without blackening. 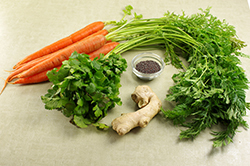 Transfer to a bowl and top with the cayenne, salt, and cilantro before serving. Recipes from Poulet by Cree LeFavour. Copyright 2011. Published by Chronicle Books, San Francisco, CA. Reprinted with permission of the publisher. All rights reserved.